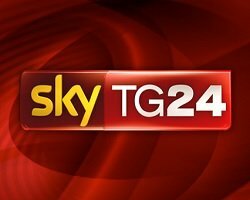 News TV Channel / Sky TG24 is Italy's second all-news channel, owned by Sky plc. Launched on 31 July 2003, it provides non-stop rolling news, weather forecasts and sports stories with half-hourly updates. The interactive version of SKY TG24, called Sky TG24 Active, was launched in January 2005. In the United States, SKY TG24 was available via satellite on DirecTV, launching in December 2004. On 7 December 2008, SKY TG24 was removed due to low subscriber levels. It is currently available on cable via RCN in Boston, Chicago, New York City, Philadelphia and Washington D.C.. A local Canadian version of Sky TG24 airs in Canada. It is owned by Telelatino Network Inc.. Most of its content are a simulcast from the Italian channel with Canadian content added as well. The channel has been available in high definition since September 2013, making it the 63rd HDTV channel offered by Sky Italia.